Scots-Irish, English, and Welsh immigrants began settling in what became known as Darlington County in the 1730s. Darlington is one of nine counties that make up South Carolina’s Pee Dee region, named for the Great Pee Dee River that runs through the northeastern part of the state. According to local legend, the town of Darlington was founded in the late 18th century as a compromise between Captain Lamuel Benton and Colonel Elias Dubose, who each wanted to build the county courthouse in his hometown. The two men decided to split the difference by leaving their respective towns on horseback heading toward each other. They place they met became the site of Darlington’s courthouse and downtown square, which became the county seat. Jews have lived in Darlington since the 19th century, though no congregation remains today. German Jews settled in Darlington well before the Civil War, establishing successful mercantile businesses. The earliest are reported to have been Joseph and Charles Frank, brothers who set up shop in 1845. Their cousins, Marx and Issac Iseman, also brothers, followed them to the inland town that was still several years away from being connected to the state’s rail system. The Isemans and the Franks must have prospered as merchants, as they ultimately acquired significant acreage in the heart of town. In the early to mid-1850s, August Nachman and brothers Henry and Hyam Hymes arrived and opened stores. Samuel Marco followed in 1856 and established his own business. Later, he partnered with Issac Lewenthal. Their company, Marco and Lewenthal, consisted of a store in Darlington square and a tenant farm. Cotton was the primary cash crop in the region. The Hymes and Marco families, unlike their fellow Darlington Jews of the antebellum period, hailed from Poland. Issac Abraham, and I. Newgast came to town to work as clerks for the Frank brothers. Michael Welsh, originally from Silesia, settled in Darlington during the Civil War and became a police officer, and later, a probate judge. Many of these early Jewish settlers did not stay in Darlington. The Civil War in particular caused significant disruption in the community. While some left to serve in the Confederate Army, others packed up and moved elsewhere. Issac and Marx Iseman moved to Charleston where Marx worked as a baker on King Street. He and Issac were also in the dry goods business together as late as 1870. The business, I. & M. Iseman, bore the same name as their Darlington store. Soon after 1870, Issac returned to Darlington where he still likely had business interests. The Darlington News reported his death in the Pee Dee town of Marion in 1894 and he was buried in Florence’s Jewish Cemetery. His descendants, most of whom are Christian, still live in and around Darlington. Another pair of Iseman brothers, Manuel and Iseman Iseman, thought to be related to Marx and Issac, lived in Marion as early as 1850. The two jointly owned more than 1000 acres of land. Iseman Iseman also ran a store in Marion until his death in 1870. His wife kept the business open another two years before moving to Baltimore with her seven children. Manuel later moved to Darlington. His son Myer earned his medical degree from the University of Louisville and returned to Darlington to operate a drug store during the 1880s. He sold the store in 1888, moved to Georgetown, and ran another drug store there before moving on again. Darlington was home, briefly, to another Jewish doctor in the late 1800s. Jacob Lopes Cardozo, an immigrant from Amsterdam, graduated from the South Carolina Medical College in Charleston in 1878 when he was in his forties. He promptly moved to Darlington, established a medical practice, and opened a drug store that sold a “choice assortment of Drugs and Fresh Medicines, Perfumery, Toilet Articles, Paints and Oils, Cigars, and articles for Christmas presents.” He gave notice in the Darlington News of his willingness to treat the indigent, a practice that was common, but not typically advertised. The Sephardic Jew is reported to have been a rabbi as a young man. He led an effort to organize a congregation of Darlington Jews, and apparently was somewhat successful. However, when he left for New York in 1883, the group fell apart. After the Civil War, Jews began to settle in Darlington in larger numbers, which resulted in a network of interrelated families whose roots spread throughout the region. The Hennigs, Hymans, Lewenthals, Sternbergers, Weinbergs, and Witcovers were merchants and often landowners as well. The Rosenberger, Manne, and Sulzbacher names appear later in the century. In 1878, an estimated 56 lived Jews in Darlington while 61 lived in nearby Marion. Surrounding small towns such as Clio, Timmonsville, and Lydia were also home to Jewish merchant families. Sally Weinberg, who came to live with her brother Abram in Darlington, met Darlington merchant Philip Lewenthal. The two married in 1881, though a few years later, they left Darlington and set down roots in Georgetown. The post-war Jewish community, larger and more permanently settled than its pre-war counterpart, became well established, with its members actively involved in Darlington's civic affairs. Newspaper accounts from the late 19th century document the involvement of the men in politics, and in the organization and direction of the fire companies and Darlington National Bank. Jews served as members and officers in the Masonic Lodges and supported the business interests of the town and region, promoting the building of a hotel and a railroad, as well as the development of a local manufacturing industry. Rabbi Joseph Chumaceiro, of Congregation Children of Israel in Augusta, Georgia, made a second attempt to organize a congregation in Darlington in 1895, but the group folded after he left for the Dutch West Indies in 1898. There was, however, sufficient interest in establishing a Jewish burial ground. The Darlington Hebrew Cemetery Association purchased land for that purpose in 1896. The members responsible were C. Alexander, H. Hennig, A. Hyman, I. Lewenthal, S. Lewenthal, Mr. and Mrs. M. Manne, E. Rotholz, N. Schultz, S. Tombacher, A. Weinberg, W. Witcover, and S. Wolfram. 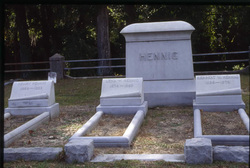 Yet even after the Darlington burial ground was established, some families continued to use the Florence cemetery. Finally, in February of 1905, Darlington Jews succeeded in organizing a congregation, which they initially named the Darlington Hebrew Association. Rabbi Jacob Klein of Sumter’s Temple Sinai traveled to Darlington on the first Sunday of each month to lead Reform services for the congregation, which numbered 49 members in 1907. A. Weinberg served as president of the fledgling congregation. By 1907, they had a weekly Sunday school with 20 students. In 1919, Rabbi Jacob Raisin of Charleston’s Kahal Kadosh Beth Elohim began visiting the Darlington Jewish community one Sunday a month in order to conduct services and run the Sabbath school. He split the day between the Darlington and Florence congregations. For more than 25 years, Raisin took the train to Florence and was later picked up by a member of the Darlington congregation and driven to a private home or the American Legion Hall for services. Darlington’s Jewish community continued to grow, reaching a peak of 85 Jews in 1927. The Ladies Aid Society, which changed its name to the Darlington Temple Sisterhood in 1925, was the bulwark of the local Jewish community. Usually numbering a dozen or fewer members, the Sisterhood worked hard to keep the congregation active, sponsoring community observances of the holidays, attending to the upkeep of the cemetery, and running the Sabbath school. The Sisterhood became the cemetery’s unofficial caretakers, managing the property until decades later, when the congregation was able to arrange perpetual care, a necessary step given the eventual demise of the congregation in the 1990s. The Sisterhood was also intent on building a synagogue. Efforts to set this plan in motion were repeatedly stymied, however. Finding a suitable lot on which to build and insufficient funds seemed to be the biggest obstacles in the late 1920s and early 1930s. In 1931, and again in 1938, the congregation received an endowment from the Minnie Barnett Estate. Mrs. Barnett of Manning had left a large sum of money in the hands of administrator Jake Weinberg, who awarded a portion to the Darlington Jewish community, among others, stipulating that the funds be used to build a synagogue. Despite the two monetary gifts, the Sisterhood’s focus shifted away from building a house of worship. The organization experienced the pervasive financial difficulties facing the rest of the country. The effects of the Great Depression began to show in the Sisterhood’s minutes for 1932. Asked to host a regional Sisterhood meeting, one member declared “no one is in the spirit for a meeting, and . . . it is all we can do to hold together at present.” They were forced to reduce their dues and cut back on their charitable donations. Even more telling, they advised Rabbi Raisin that while they could pay his expenses, they could no longer afford to pay him a fee for his monthly visits. A dramatic reduction in the number of Jews in Darlington may have contributed to the tight budget. A population estimate of 35 Jews in 1937, down from 85 Jews ten years earlier, suggests that some families may have been forced to relocate. The congregation would not discuss building a synagogue again until the 1950s. After Rabbi Raisin’s death in 1946, organized religious activity all but ceased. 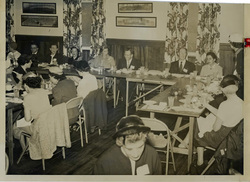 In 1948, the Sisterhood asked the association’s president to call a meeting to see if a congregation “might be formed.” These efforts appear to have been unsuccessful since the Sisterhood’s 1950 minutes refer to “the former congregation.” The Sunday school became inactive as well since there were so few Jewish children in Darlington. The few Jewish children who still lived in Darlington traveled the ten miles to Florence for Sunday school each week. Finally, the Darlington Hebrew Congregation got off the ground in June 1953, when Darlington Jews gathered to reorganize. A year later, they hired Rabbi J. Aaron Levy, the rabbi in Sumter, to lead monthly services, which were held at the local Masonic Lodge. The reconstituted congregation soon began to discuss the feasibility of building a temple. Members were in favor of the idea if it could be accomplished without going into debt. Plans were drawn up and a committee began searching for a suitable location. In the end, the congregation never built a synagogue since there were simply not enough members to justify it. Their numbers had shrunk even more with the passage of time. In 1966, 13 members at the October congregational meeting debated whether Rabbi Levy should be rehired for the upcoming year given the small size of the congregation. The majority of the members were also affiliated with Florence’s Temple Beth Israel. One couple, after moving to Darlington in 1938, began attending services in Florence for services since its congregation consisted of more young couples like themselves. The members of Darlington’s congregation agreed to cut back services from once a month to two to four times a year. Rabbi Levy’s service to Darlington ended with his retirement in 1970. The Sisterhood became the successor trustee of the Darlington Hebrew Cemetery Association in 1956 via a court order that gave the group full legal rights to manage the burial ground, which is part of Darlington’s Grove Hill Cemetery. Arranging perpetual care for the plots became the overriding issue for the congregation and the Sisterhood during the ensuing decades. Funds once designated for building a synagogue were put into a perpetual care trust. Although the number of Jews in Darlington decreased during the decades after World War II, those who remained continued to be involved in the larger community. With a number of professionals such as pharmacists, lawyers, judges, and doctors among them, they were active in politics and organizations such as the Kiwanis Club, the Lions Club, the Chamber of Commerce, and the Darlington Country Club. 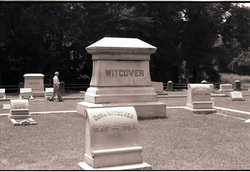 D. D. Witcover was an alderman and the president of the State Fair Association for 30 years. Dr. O. A. Alexander served three terms each as city councilman and mayor. Darlington's Jews also gave their time and energy to the County Historical Society, the Red Cross, the Boy Scouts, and various health-related groups. The loss of Rabbi Levy to retirement and the small size of the community led Darlington’s Jews finally to disband their congregation and join Beth Israel in Florence. Although it too was Reform, one Darlington member initially found it “much too Conservative for our liking,” citing the amount of Hebrew and the use of yarmulkes and prayer shawls. The remains of the Darlington congregation and Sisterhood exist in the form of a trust fund, managed by two descendants of the Jewish community. The trust fund purchased a Torah for the Florence congregation in honor of Hilda Hennig Cohen, a longtime leader of the Darlington Jewish community.